i spent yesterday at a conference on racial disparity in Justice. as advertised, the panels offered a combustible mix of state supreme court Justices, police officers, mayors, business reps, reporters. it was a good exercise in public criminology, with a handful of academics sharing research, weighing in on some concrete policy recommendations, and learning from the assembled policymakers, citizens, and community leaders. there was more than a little grandstanding, of course, but also some productive discussion. Justice alan page (who seems to show up a lot in this blog) referenced the distinction between people we’re “mad at” versus those we’re “afraid of.” the council’s research and recommendations focused on the disparate impact of overenforcing minor crimes among the former group — lurking, loitering, disorderly conduct. 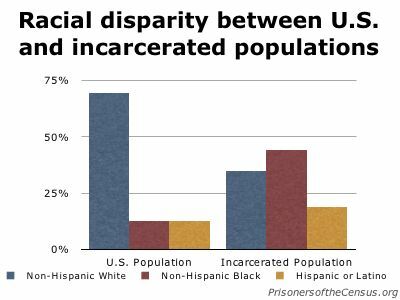 we drag a lot of people of color into the system for low-level offenses (sometimes called garbage cases in the system) that never go anywhere. more precisely, racial disparities in arrest for minor crimes are generally more skewed than conviction disparities. failing to criminalize such stuff runs counter to the broken windows orthodoxy, of course, but even minneapolis’ assistant police chief sharon lubinski agreed that “we can’t arrest our way out of this problem.” business representatives want to “clean up” downtown, but most would be happy with effective community- and school-based alternatives to criminalization; such approaches might also be more consistent with traditional minnesota values than, say, panhandling ordinances. i spoke on the collateral consequences of conviction, but one big problem with criminalization is the increasingly public nature of arrest records. there was a fascinating exchange between a target corporation human resources professional (we fire people for failing to disclose their records, not for having records) and a former felon (i know that target won’t hire you if you check that box on the application). i saw a similar exchange between a downtown business representative (something’s wrong in the system when a guy is still on the street after twenty arrests) and judge kevin burke, who brought drug courts to minnesota (he may have been arrested twenty times, but what if he was never convicted?). to take another example, the council reported that youth of color now make up nearly 80 percent of the juveniles appearing in hennepin county (minneapolis) court, with 25 percent of those cases referred from schools (not including truancy violations). assistant school superintendent birch jones squarely addressed his institution’s role in exacerbating Justice system inequalities while at the same time reminding us of the resource constraints that make it difficult (impossible?) for some schools to address serious discipline problems in-house. such discussions may pave the way for alternative interventions for school disorderly conduct cases that, under current practices, would be referred for formal prosecution. similarly, the council reported that low-level offenses brought directly to court via police officers (tab charges) rarely result in convictions, but continue to haunt people seeking employment or housing. police and prosecutors were then invited to discuss a proposal to require all misdemeanor tab charges to be reviewed by a prosecutor prior to initiating court processes. i could go on, but you probably get the idea. i had no hand in the council’s recommendations and would need to study the evidence much more closely to make a strong case for them. nevertheless, i can get behind the council’s primary goal without hesitation: reducing disparities and enhancing public safety. this fits nicely with my approach to felon reenfranchisement and prisoner reentry more generally. while some of the elected officials seemed to skirt the big issues, this is likely because they fear being tarred with the soft on crime brush. if reintegrative Justice policies can be shown to increase public safety and do so cheaply, i’m optimistic that they’ll come around as well. as gas prices have risen, i’m surprised we haven’t heard more about old-fashioned theft-by-siphon. gas has been stolen by siphoning for about as long as we’ve had automobiles. in fact, the first locking gas cap appeared in 1932, motivated by a rash of pre-SUV depression-era drivers. i’d guess that siphoning from individuals is much less likely to result in arrest than driving off from a gas station, but thieves have opted for the latter approach in recent years. aside from numerous stories about a nevada murder of would-be siphoners, a search of google news yielded only scattered references to gas theft (e.g, in florida, minnesota, oregon). while capable (and armed) guardianship may be a factor, i’ll hypothesize that the absence of mass gas thefts can be explained by a combination of target hardening and teenagers’ lack of technical skills. with regard to technical skills, gas has been so cheap and plentiful for the last twenty-five years that illegal siphoning has become something of a lost art among the american teens and twenty-somethings most likely to commit theft. this generation also likely knows less about car repair and maintenance, as today’s vehicles require far less repair and maintenance than, say, the mid-seventies energy crisis. i’d suspect that the kids have done less legitimated siphoning (e.g., between lawn mowers and cars) as well, but this might be overgeneralizing based upon a small sample of yardwork-resistant kids i know. target hardening is probably the bigger factor. newer vehicles employ devices that thwart siphoning, such that one can no longer simply stick a hose into tank A, prime it, and transfer the gas into tank B. fuel check valves, designed to stop leaks and explosions when vehicles roll over, complicate life for siphoners. moreover, now that many tanks are made of plastic rather than rust, crooks are less likely to immolate themselves piercing and draining the tanks or cutting the fuel lines. still, it isn’t difficult to find many old cars or trucks with enormous and unguarded gas tanks. once more of these stories make the news, the kids will likely catch on and employ jackrabbit pumps and other labor-saving devices. in response or anticipation of this, drivers of older vehicles will purchase locking gas caps, as my father did for the family maverick back in the 1970s. national statistics are tough to come by, but i’d bet that we’ll be hearing much more about gas theft by this time next year, if not by the end of the summer. i just received my copy of the bureau of Justice statistics’ survey of state criminal history information systems, 2003. reporting is inconsistent across the states, but there were 71,028,500 individual subjects listed in state criminal history repositories on december 31, 2003. this is a twenty percent increase from the 59 million files in 1999, but the bigger change is in their availability: online public and private access to these criminal history records has increased dramatically over this period. Dear Dr. Uggen: I am a 48 yr old with a felony conviction (escape) in GA. I have a substantial criminal record (drug and property crimes) dating back to the 1970’s due to a drug addiction that began as a teenager. Despite my addiction I was able to complete undergraduate school and attended law school before my disease overtook my life entirely. I entered treatment at age 30 and, with the help of support groups, was able to earn an MBA by age 32. I was able to find a good job at IBM but was laid off due to corporate down-sizing in 1998. I was convicted of felony escape in GA as a result of leaving a half-way house type of institution. I was sentenced to this institution for a misdemeanor theft conviction resulting from my having relapsed into my addiction. I served 20 months in a GA prison and have not been able to find sustainable (above-poverty level) employment since my release. In many ways my sentence (5 yrs.) 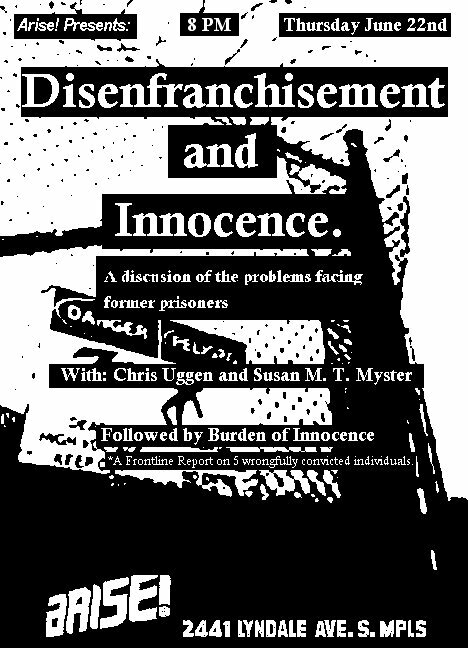 has become a de facto “life sentence” due to the stigma of my conviction. It will probably shorten my life due to the fact that I cannot obtain affordable health insurance from an employer. One could even say that, in that respect, I have been given a “death sentence” of sorts. I have tried in vain to secure employment here in Augusta, GA but even the most menial positions in the labor market have rejected me. It is a very difficult existence… Pete C.
Dear Pete C: I understand your position you are not alone. I face the same fate. I’m on the grind seeking employment. It doesn’t seem to matter to anyone that I served my country in the Gulf War. I have tried to lie about my past and I have also tried to be truthful but to no avail. It has been 8 years since this “F” has been on my record. I can’t offer you any help only support. Keep your head up and I hope you have some good people in your corner. on friday, jazz hayden asked two questions of the assembled luminaries at john jay. first, “how many of you have ever committed a crime for which you could have been incarcerated?” most hands quickly rose, then descended when he asked, “how many think you should lose your right to vote now because of that act?” we might ask the same thing about employment: how many think you shouldn’t be able to make a living, eight years after your release? one can find employers in most communities who might give a break to former felons — either because they have a history themselves or because such efforts have been rewarded by highly productive and loyal workers truly appreciative of the opportunity. if anyone in georgia or elsewhere can offer some advice or contacts for pete c., please pass them along. i haven’t walked in his shoes and my research offers nothing more than tired advice about “starting at the bottom, keeping the faith, and banging your head against the door.” as long as you can take the pain, you’ve got a fighting chance of breaking through. this thursday night i’m at arise! bookstore in minneapolis, talking about locked out on a double-bill with a fascinating speaker from the innocence project of minnesota. susan thurston myster is a forensic anthropologist at hamline university. she should offer a great perspective on the project’s efforts to give investigative and legal assistance to inmates with provable claims that they have been wrongly imprisoned. 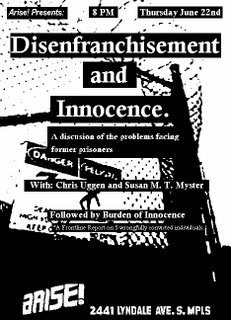 a free showing of the documentary burden of innocence will follow, tracking former prisoners’ lives after their wrongful convictions. the council on crime and Justice is holding a public criminology conference on their racial disparity initiative on june 28 in minneapolis. over the past five years, the council has written 17 reports on race and Justice. they are now pulling them together to summarize the knowledge and hammer out some action steps. the panels have representatives from an incredibly diverse set of institutions and publics, though not everyone will show up. there are ex-offenders, clergypersons, social workers, attorneys, community residents, businesspersons, and academics. mayors rybak of minneapolis and coleman of st. paul are on the program, as are st. paul’s police chief john harrington and minneapolis’ assistant chief sharon lubinski, minneapolis school superintendent bill green, state supreme court Justice alan page, and judge kevin burke of hennepin county district court. as for criminologists, michael tonry will serve on a panel discussing causes of the disparity, todd clear will be in the collateral consequences group, and i’m on the action steps and ethics panel. i probably won’t say much, since my panel is scheduled to include a republican state senator, business folk, police officers, case workers, and don shelby, local anchor god. it should be fun. or a free-for-all. or both. anyone interested in racial disparities in Justice might find something interesting on the program. you can register online, for a suggested donation of $20. attorneys can get CLE elimination of bias and ethics credits but need to kick in more money (sorry, angie). tom johnson of the council is expecting a pretty good crowd. the conference is june 28 at minneapolis community and technical college, 1501 hennepin avenue. michael bischoff at the council on crime and Justice sends word of their search for a new director of projects to provide leadership on early intervention and prevention projects. they seek someone with “passion and talent for finding innovative ways to prevent crime, reduce racial disparities, and build partnerships.” The salary range for the position will be $45,000 – $60,000. you can learn more about the council at www.crimeandJustice.org. Organization: The Council on Crime and Justice is a non-profit agency committed to building community capacity to address the causes and consequences of crime and violence through research, demonstration and advocacy. Position Responsibilities: The Director of Projects will provide leadership over 2 or more demonstration projects. Projects may include re-entry, alternative sentencing, victim services and youth early intervention. Key responsibilities include: managing project staff and activities, furthering implementation of the demonstration model, developing and implementing work plans, interpreting the projects and services to the community, working with the Research Dept. to evaluate projects, completing required reporting, pursuing grant and marketing opportunities, developing new projects and/or enhancing existing projects, developing and monitoring budgets, providing back-up support to other Director of Projects, and participating as a member of management. Qualifications: Bachelor’s degree, graduate or professional degree preferred and 3-5 years experience in project management and development, or equivalent education and experience sufficient to perform the responsibilities. Skilled in supervision and coaching. Strong written and verbal communication skills. Ability to establish effective relationships with all stakeholders. Ability to provide leadership over teams, as well as, be an active participant. Strong problem solving and conflict negotiation skills. Ability to have both a broad conceptualization and an understanding of details. Skilled at strategic thinking. Invested and motivated to move forward with organizational agenda. Committed to remaining informed and learning about leadership theories, project development and project specific information. Ability to work effectively across cultures and demonstrate sensitivity to ethnicity, gender, age, sexual orientation, disability and faith.